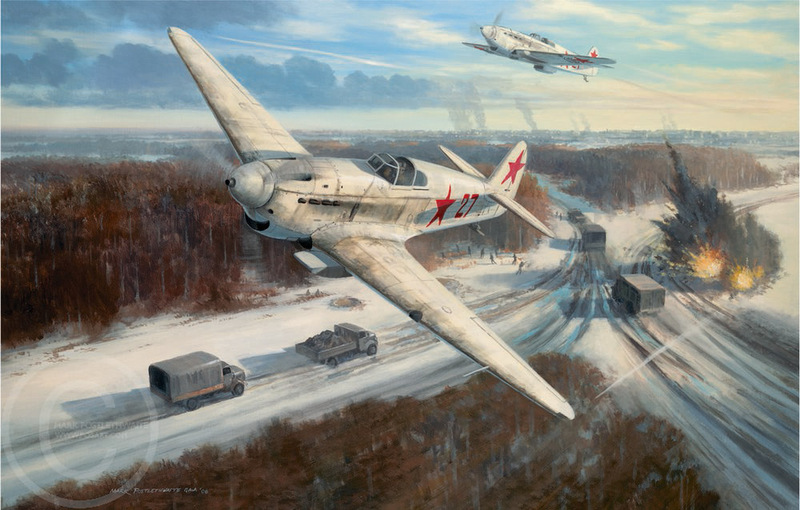 Yak-1s of the 11th Fighter Regiment attack a German supply convoy within sight of Moscow, Dec 1941. SIGNED IN MOSCOW BY Lt Gen STEPAN MIKOYAN Hero of the Soviet Union. After his wartime career with the 11th Fighter Regiment, Lt Gen Mikoyan became one of the Soviet Union's most illustrious test pilots, testing many of his family's classic MiG jet fighter designs. A UNIQUE CHANCE TO COLLECT THE RARE SIGNATURE OF ONE OF RUSSIA'S AVIATION ELITE!